‘Tis the Season to Run Campaigns! The Campaigns tab is used to activate campaigns that can be used by the Service department of a dealership to upsell operations at the point of creating a booking on the system or receipting an existing booking into the Workshop as a job. To access Campaigns, click on the tab at the top of the screen. 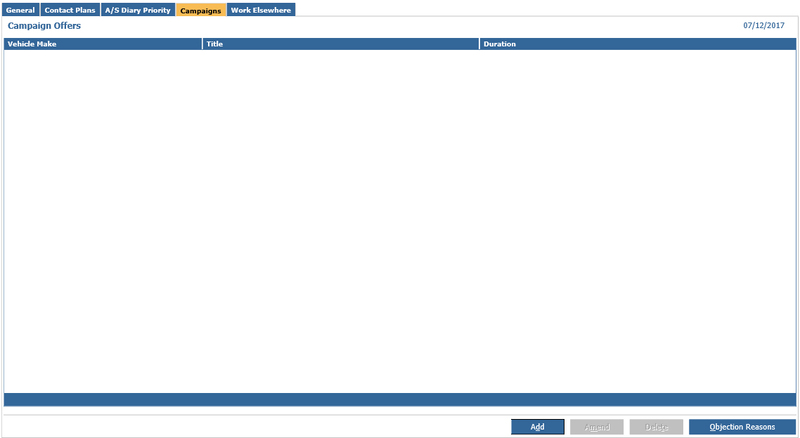 Existing campaigns are displayed in the top section of the screen. Use the “Objection reasons” option to record possible reasons for customers objecting to the campaign offer. These reasons are displayed if the campaign offer is rejected. Select the “Add” option from the bottom of the screen, and complete the ‘Description’ field with the Objection Reason. Then click on “Accept” to store the entry. A new campaign can be created using the “Add” option, whilst “Amend” can be used to make changes to an existing campaign. To remove an obsolete campaign from the system, select “Delete”. Once the “Add” option has been selected, a popup is displayed, if the campaign is only to be applied to vehicles of a particular make, select the franchise required from the drop down menu. Leave this option set to ‘Please Select…’ for the campaign to be applied to all makes of vehicle dealt with by the workshop. If the campaign is to be run seasonally, select the ‘Seasonal Campaign’ parameter and the months of the year in which the campaign is to run. If ‘Seasonal Campaign’ is specified, the campaign will automatically activate each year until it is removed. Alternatively, a date range for the campaign to run can be specified. Complete an initial script and final script – these are displayed to the user at the point of taking the service booking via the Workshop module, and are intended to prompt the user to mention the specific benefits or costs for the work being offered by the campaign. The Objection Script appears if the customer decides to refuse the offer, and attaches to the Objection Reasons created earlier. The bottom section of the window relates to the handling of the campaign by the Workshop module. Select a Job Type from the drop down menu. If the campaign is to be offered at a Fixed Price, complete the value within the field. Alternatively, load hours and invoice hours can be added. Campaign jobs can also be flagged for parts. Checking this box will automatically inform the parts department of the parts that are required for the job upon completion of the booking, allowing for pre-picking or the ordering of parts required to take place. Once all of these options have been completed as required, select the “Accept” option to activate the campaign. When a Workshop booking is taken, the campaign offer is displayed along with the script, allowing for uniformity of customer offer. Objection Reason and displays the objection script detailing the benefits of the campaign. 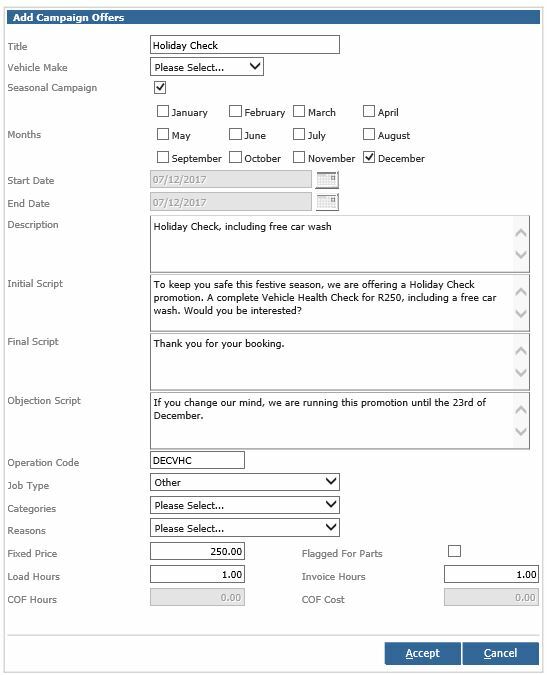 The script entered is displayed to prompt conversation with the customer; a booking is then either completed for the campaign or declined if the work is not required by the customer. For this reason, the Campaign Report is split into two separate sections – one containing the details of successful campaign bookings, the other containing details of the reasons customers are giving for declining the campaign offer.